The intoxicating South African fruit is beloved by humans and elephants. A relative of cashew, mango, and pistachio plants, the marula tree is iconic in South Africa. Most diners consume the fruit raw, pureed in juice, or cooked in jams and jellies. It’s also well known as an ingredient in the popular cream liqueur Amarula (though most of the fruit’s flavors take a backseat to the drink’s creamy, butterscotch-flavored base). Humans aren’t the only ones who appreciate marula fruit, though. Baboons, warthogs, impalas, kudu, and giraffes have all been seen gorging on its juicy flesh. In some regions, the tree is referred to as the “elephant tree” because the animals love its fruit so much. Early travelers to South Africa came home with tales of wobbly elephants wandering the safari after eating the fallen and fermented fruit. In 1974, filmmaker Jamie Uys (of The Gods Must Be Crazy fame) produced a documentary where wild animals acted intoxicated after eating marula fruits. Unsurprisingly, the footage was a hit. It even earned Uys the Golden Globe award for Best Documentary Film, but later research suggests that the scenes were probably staged. 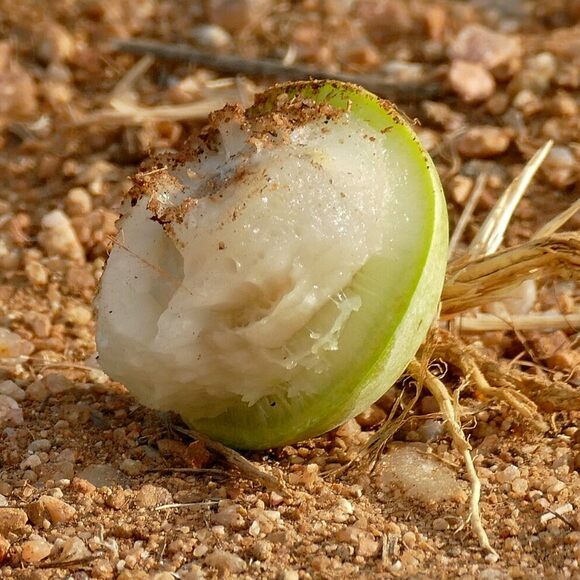 Elephants would need to eat a very large amount of fermented marula fruits to cause such effects, and they typically go for fruit fresh from the tree. Marula fruits start green and grow golden yellow as they ripen. They can be harvested after falling to the ground during the South African summer, between January and March. In addition to its variety of wildlife, this park also features local fruit, such as marula. In South Africa, women transform a tart fruit into a celebrated sour brew.